eHarmony.com is dedicated towards assisting senior women and men find the love of their life. The site has more than 33 million registered users and is positive about changing people's lives The Compatibility Matching System of the site is the main factor that differentiates their service and all the other senior dating sites. The matching system picks out the best matching and compatible senior members by narrowing down the search from several thousands of seniors and ensures great relationships are built. eHarmony prides itself on having a very diverse membership base with over 33 million registered users from almost all states in the US and more than 150 countries; it has around 2.3M visitors to its site each month with visitor age-groups demographics fairly evenly spread between various age bands. In 2017, it was reported that eHarmony had about 750,000 paid subscribers and 10 million active users. 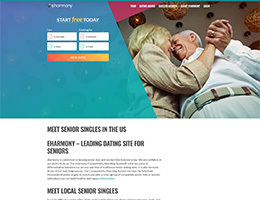 Sites such as eHarmony are sometimes called guided dating sites as users do not search for other members but rather are shown matches based on their compatibility tests and profile entries. In this case, matches are picked with the help of the 29 Dimensions of Compatibility test from eHarmony. This test provides questions and test users' answers. Members then receive quality matches from a large pool of other daters, although they need to get a subscription in order to communicate or move further. Initially members used to send Icebreakers to let their potential match know they are interested, before knowing about each other better by picking from a list of questions after reviewing the user’s profile. The next stage involves getting to know about one another by answering a set of 3 open-ended questions which reveal inner values. If after such guided communication, users feel they have a real connection, then they can get in touch eHarmony's safe email system. This process has been developed by a clinical psychologist, Dr. Warren, and has proved to be really effective. eHarmony offers many types of subscription plans to choose from with 1, 3, 6 and 12 month plans offering a variety of permutations from $59.95 for one month reducing to $29.95 for 3 or 6 months and $19.95 for 12 months. Or there is the "TotalConnect Plan" which includes all the features in the basic plan plus a deeper analysis of a user's personality using Premium Personality Profile or SecureCall which allows users to speak to their matches without revealing their real phone number, or RelyID which quickly verifies user's name, city, and age. The site offers a Premier Plan which includes the "Ultimate Guarantee" which allows an extension of membership for an additional 12 months if no matches are found during the membership period. eHarmony's support staff are available 24/7 with live chat help if the Harmony Premium Plan is selected. eHarmony is one of the largest, most popular sites around with a number of interesting and useful features. It often called a guided dating site as it eases members into relationship appearing to be the best for them.